Because of the radiation danger to women of child-bearing age, those under 30 did not go, but being 35 in 1987, I began my 4.5 years of work at Chernobyl. ……….. In 1987, when I first arrived at Chernobyl, my group of about 20 scientists from the Ozyersk radio-ecology lab started a Department of Environmental Decontamination and Re-Cultivation. We used a 10-acre greenhouse complex for our plant studies, built before the accident, and for office space we used an empty, nearby kindergarten……..
Like many liquidators I ‘wear’ a ‘Chernobyl necklace’, the scar on the lower throat from thyroid-gland surgery. * While working in the exclusion zone I experienced slurred speech, memory loss and poor balance. One of my bosses and I realized that we were forgetting appointments and obligations and agreed to help each other remember who, what, where and when. I had severe amnesia for a time and read letters I wrote my mother to help fill in forgotten years. The Chernobyl accident is not over, in fact its damaging effects on people and the land will only taper off slowly for generations—lingering harm that is almost certainly unique to nuclear accidents. 8 Years On: Number of Kids Dives in Disaster-Hit Fukushima Municipalitieshttps://www.nippon.com/en/news/yjj2019031300954/8-years-on-number-of-kids-dives-in-disaster-hit-fukushima-municipalities.html Mar 15, 2019 Fukushima, March 15 (Jiji Press)–In 10 Fukushima Prefecture municipalities where elementary and junior high school have reopened after the lifting of nuclear evacuation advisories, the number of students stood at 758 as of May 1, 2018, about 10 pct of the level before the March 2011 disasters. As a result, the local governments are facing difficulties in school operations. In the Yamakiya district of the town of Kawamata, the evacuation advisory was removed in March 2017, six years after the nuclear accident at Tokyo Electric Power Company Holdings Inc.’s <9501> Fukushima No. 1 plant, heavily damaged by the 9.0-magnitude earthquake and the ensuing tsunami. Elementary and junior high schools reopened in the town in April 2018, but five six-graders are the only elementary school children. With no freshman joining this spring, the elementary school plans to suspend its operations in April. New study on the social consequences of the 3/11 nuclear accidentin Fukushima prefecture. This article seeks to explain how, given Japan’s “nuclear allergy” following World War II, a small coastal town not far from Hiroshima volunteered to host a nuclear power plant in the early 1980s. Where standard explanations of contentious nuclear power siting decisions have focused on the regional power utilities and the central government, this paper instead examines the importance of historical change and civil society at a local level. Using a microhistorical approach based on interviews and archival materials, and framing our discussion with a popular Japanese television show known as Hatoko’s Sea, we illustrate the agency of municipal actors in the decision-making process. In this way, we highlight the significance of long-term economic transformations, demographic decline, and vertical social networks in local invitations to controversial facilities. These perspectives are particularly important in the wake of the 2011 Fukushima crisis, as the outside world seeks to understand how and why Japan embraced atomic energy. The Kyshtym Disaster is named after the nearest known town on the map. In 1957 a mistake in the reprocessing plant led to an explosion that contaminated 20,000 square kilometres – an area that did not appear on any map. Nor did the nearby town of Chelyabinsk, which was a so-called “secret” or “closed town” for Mayak nuclear complex workers. It is also Kutepova’s birth place. Around 270,000 people were directly affected by the disaster. Only in the 1990s, after the fall of the Soviet Union, did the true impact of the accident become apparent. Only then did the Russian nuclear industry, now known as Rosatom, take some responsibility. 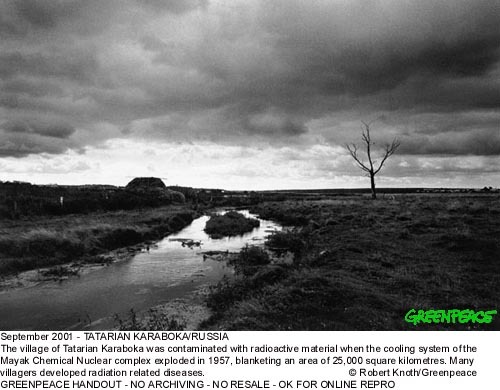 Only after Kutepova started supporting local victims and photographer, Robert Knoth, who recorded the the lives of those affected, did Rosatom concede to evacuating those who suffered most. First of all, not everyone in the village was moved. Some of the people’s documents were not in order. They had to stay in a ghost town without services. And five other villages were not evacuated at all. The pollution from Mayak never really stopped, either. Radioactive waste-water continues to be dumped in ponds around and connected to the Techa river. In all the local villages Greenpeace Russia found highly elevated strontium-90 levels. The same levels as found in the evacuated village of Muslyumovo. Rosatom already acknowledged several times that water is seeping out of the ponds into the Techa river system. And the people of Muslyumovo and it’s surroundings are still depending on that water for their gardens. Still, Rosatom continues to dump its waste into the ponds. But, they are not called “ponds” anymore. They are now called “special industrial ponds”, “objects of nuclear energy use”, and the dumping is called “inserting liquid radioactive waste for storage”. Mayak is everywhere. Rosatom may be polluting a Mayak near you: by reprocessing spent nuclear fuel from your nearby nuclear power station, by building a nuclear power station that will later send its spent fuel to Russia for reprocessing, or by loading your neighbouring nuclear plant with reprocessed uranium fuel from Mayak. Rosatom’s operation in Mayak illustrates that the nuclear industry is not interested in people. After all, 60 years since the disaster the people around Mayak are “a sort of radioactive waste”. Jan Haverkamp is an expert consultant nuclear energy and energy policy for GreenpeaceCentral and Eastern Europe and part of Greenpeace’s Radiation Protection Advisors team. The islanders and fishing crew suffered radiation sickness, hair loss, and peeling skin. Crew member, Aikichi Kuboyama, died six months later in a Hiroshima hospital. Island children, suffered lifelong health effects, including cancers, and most died prematurely. The Lucky Dragon sailors were exposed to 3-5 sieverts of radiation. One sievert will cause severe radiation sickness leading to cancer and death. Five sieverts will kill half those exposed within a month (like the workers who died at Chernobyl within the first few week). Ten sieverts will kill any human being. Hiroshima and Nagasaki victims received 150 Sieverts. Even microorganisms perished. Today, inside the crippled Fukushima nuclear reactor-2, the melting core releases 530 sieverts per hour, enough to kill a human instantly and melt steel robotic equipment within two hours. When we hear the term “collapse of industrial society,” some may picture a doomsday or a Hollywood apocalypse film. But the collapse of societies – like in Rome, Mesopotamia, or the Rapa Nui on Easter Island – doesn’t work like that. The “collapse” of a complex society usually involves ecological habitat degradation that can take centuries. So, what does “social collapse” really look like? James Kunstler calls the collapse of industrial society a “long emergency” – a process that unfolds in fits and starts over generations. Some social conflicts we witness in the world today – banking crises, war, refugees, racism – can be understood as symptoms of this long, ecologically-triggered collapse. Russian author Dmitry Orlov describes the five stages of collapse: Financial, commercial, political, social, and, finally, cultural. When business-as-usual becomes impossible, communities seek alternatives to currency trading; markets fail, faith in government disappears, trust of neighbours erodes, and people lose faith in common decency. Societies evolve complex solutions to solve social problems that arise, generally from environmental limits. Eventually, the marginal benefits of these alleged solutions decline. Consider oil, military aggression, or nuclear power as solutions to problems, that later manifest unintended consequences. As technical solutions meet bio-physical limits, added investment leads to less benefit, until the society grows vulnerable to catastrophe, such as global warming, war, or radiation. Societies collapse, according to Tainter, when technical complexities cost more than they return as benefits. This understanding of social collapse fits the state of chaos now unfolding at the nuclear plant at Fukushima. TEPCO, the company that owns the Fukushima reactors, ignored early warnings of risk, from both inside and outside the company, because the safeguards were too expensive. Thus, the 2011 earthquake and tsunami destroyed the plant’s cooling systems and led to a core meltdown in all three reactors. Today, six years later, the reactor cores are melting down through the rock, and radiation levels are so intense that even robots can’t survive long enough to locate the burning fuel rods. Removal of the rods, originally scheduled for 2015, then delayed until 2017, has been delayed again, with no end in sight. Meanwhile, 300 tons of radioactive water floods into the Pacific Ocean every day. Cleanup cost estimates have risen to several billion Euros per year and decommissioning is now expected to take about 40 years. In December, 2016, the Japanese government announced that the estimated cost of decommissioning the plant and storing radioactive waste, if they can achieve this at all, would reach over 21 trillion yen (€180 billion; US$ 200 billion). This scenario is based on no major earthquakes occurring before the 2050s. TEPCO will likely go bankrupt before it will pay these costs, so the government has stepped in, which means the citizens pay the costs, just as they bailed out the banks after the last economic collapse. This is a core policy for large, modern corporations: Privatise the profits, socialise the costs. The nuclear “solution” to growing energy demand – now a massive technical and financial black hole, with negative marginal returns, draining scarce resources from struggling communities – is what industrial collapse looks like in the real world. The wealthy may not notice collapse in the early stages, as the first victims are the poorest and most vulnerable. The nuclear meltdown at Fukushima displaced over 150,000 people. Some 1,600 died during evacuation, and the survivors live in makeshift camps on meagre allotments of food and supplies. As families abandoned their homes, lifelong dreams shattered, childhoods were disrupted, families broke apart, and modest enterprises lost forever. Women and children suffered the greatest challenges and risks due to “a yawning gender gap” in Japanese society, as Kendra Ulrich writes in “Unequal Impact.” Among the 34 highly developed countries, ranked for gender wage gap, Japan stands at the bottom with South Korea and Estonia. After the nuclear meltdown, single mothers faced financial and social barriers to recovery. Radiation puts fetuses and young children at the greatest risk for future health effects. Last year, Ichiro Tagawa, 77, returned to his village of Namie and reopened the bicycle repair shop that had been in his family for 80 years. “I am so old,” he told a New York Times reporter, “I don’t really care about the radiation levels.” Citizens have measured radiation in Namie at 4 microsieverts an hour, enough to receive a cumulative 3-sieverts (Lucky Dragon level) in a month. To save money, the Japanese government has declared some towns near Fukushima “safe,” by increasing the radiation limits and then cancelling evacuee housing and insisting that citizens return to those “safe” villages. Sending people back to that environment could amount to random murder, since some will attract cancer and die from the radiation. Corruption and cover-up have become a way of life inside TEPCO and the nuclear industry. The Japanese government and TEPCO also increased “safe” radiation limits for plant workers by about 700-times, and then ordered scientists to stop monitoring radiation levels in some areas of the plants that exceed even these new, dangerous regulations. According to Tomohiko Suzuki’s book, Yakuza to Genpatsu (The Yakuza and Nuclear Power), TEPCO subcontractors pay bribes to Japanese crime gangs, the Yakuza, to obtain construction contracts, and the Yakuza pay politicians and media to keep quiet. Workers lured into the plant include the homeless, the mentally ill, illegal immigrants, and former Yakuza debtors. This deadly industry has now left dead zones and ghost towns around the world. The Hanford nuclear storage site in the US, Acerinox Processing Plant in Spain, The Polygon weapons test site in Kazakhstan, the Zapadnyi uranium mine in Kyrgyzstan, and countless other uranium mines, decommissioned plants, nuclear waste dumps, and catastrophes like Fukushima and Chernobyl. No one knows exactly how many people have died due to the Chernobyl meltdown. The Russian academy of sciences estimates 200,000 and a Ukrainian national commission estimated 500,000 deaths from radiation’s health effects. In 1983, a Yorkshire television station uncovered evidence that child leukemia had increased ten-times in the village of Seascale, near the Sellafield/Windscale nuclear site. It has become a deadly radioactive blotch on the landscape, leaking radioactive plutonium-24, americium-241, and caesium-137 into the surrounding environment, and sending bomb grade plutonium into the world’s political environment. According to the BBC, the cost of cleaning up the mess is now estimated at £70-billion, and rising annually, as one corporation or consortium after another fails to make progress, but always makes money. These cleanup costs now consume most of the UK’s “climate change” budget since nuclear power was once considered a solution to carbon emissions. In February, the EDF Flamanville nuclear plant in France – three-times over budget and years behind schedule – closed after an explosion and fire. France faces a €200 billion cost to decommission 58 reactors at the end of their life. Germany set aside €38 billion to decommission 17 nuclear reactors, and the UK estimates a cost between €109‒250 billion to decommission UK’s nuclear sites. This is the face of industrial collapse, when alleged solutions become bigger problems. Nuclear power has now become a massive liability, draining resources from communities that need schools, hospitals, and the essentials of life. Joseph Tainter, Jared Diamond, and other researchers point out that some societies – Tikopia island, Byzantine society in the 1300s – avoided collapse, not by increasing complexity with better technology, but by down-sizing intentionally, learning to thrive on a lower level of complexity. “Les civilisations sont-elles vouées à disparaître?”: Les Cahiers de Science & Vie, (n. 109). “Culture and the Environment on Easter Island and Tikopia,” Ben Ewen-Campen, Swarthmore, 2003). “Nuclear refugees tell of distrust, pressure to return to Fukushima,” Japan Times, March, 2016. “Energy/War: Breaking the Nuclear Link,” Amory Lovins, 1981; and Annual Report, Commonwealth Edison Company, 1952; at Nuclear Energy Information Service. Sellafield, UK, £70bn clean-up costs, BBC, 2014. Great Lakes community contemplates nuclear plant closure, Marketplace, By Rebecca Thiele, May 01, 2017 “…….some residents are happy to see the plant go. Palisades is one of the oldest nuclear plants in the country and has had several emergency shutdowns. Several nuclear plants are shutting down nationwide thanks to changes in the energy sector……..
Covert Public Schools gets about half its funding from taxes on Palisades Nuclear Plant — $4 million a year. ……. The radioactive waste will stay on the Lake Michigan shoreline until the federal government finds a permanent storage site for spent nuclear fuel. Palisades officials said the waste will be safe in 20-foot-tall canisters called casks…….